Looking for a great value Family Break to Tayto Park? Then look no further than the Bracken Court Hotel! Choose from our 1, 2 or 3 night Family Packages and in just over 30 minutes drive you will be at Tayto Park in Ashbourne, Co. Meath where you are guaranteed to have a fun-filled family day out. Tayto Park is an American-themed park on over 55 acres with over 100 attractions to see! 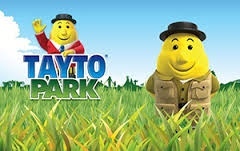 Tayto Park has something for families of all ages - from the Pow Wow Playground to the Geronimo Thrill Zone and not forgetting Mr. Tayto himself and the Tayto Factory Tour. This year Tayto Park are opening on the 26th March with the very exciting addition of the largest inverted wooden Rollercoaster in Europe, as well as many other new attractions so if you are looking for a great day out for all the family you definitely won't need to look any further than Tayto Park! We have Family Breaks that are tailored especially for Tayto Park and even if you don't book a Tayto Park package in advance you can buy tickets to the park from our Reception during your stay.